Hi 4 Head Records HFHCD006 Drum energy! 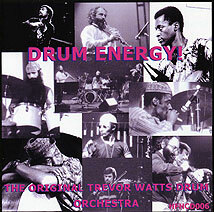 Trevor Watts, alto and soprano saxophones; Peter Knight, violin; Nana Tsiboe, percussion; Kofi Adu, percussion; Ernest Mothle, bass; Liam Genockey, drums. Recorded live in 1989, no other recording details. Photographs (front cover reproduced above) by Jak Kilby.